This estate diamond engagement ring features two diamond topped bands to enhance the beauty of your engagement ring. Eighteen fiery diamonds will add extra richness as they add embrace your engagement ring. 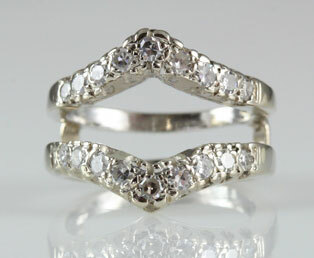 This pretty ring guard has appx 3/4 carats of diamonds mounted in 14kt 585 white gold.